I'm so glad it's Friday! It's been kind of a crazy week--the boys had 2 snow days at the beginning of the week and it's been super cold here. We are finally warming up a little too--it's supposed to be 34 degrees today, so much better than single digit temperatures. I made nine this time, so I'm a little bit ahead. 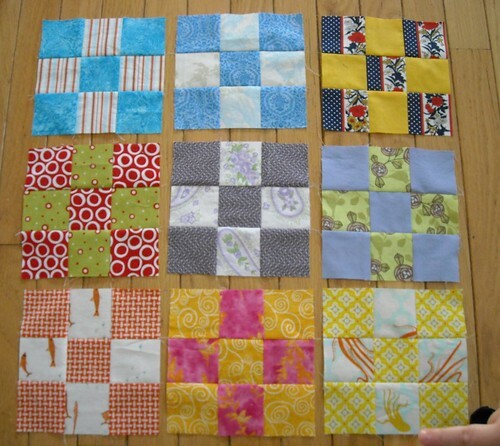 I have the fabrics picked out for the next batch, too. Yesterday I worked on my son's Sir Francis Drake costume for the 5th grade wax museum that's happening today! Nothing like the last minute, right? (I would have worked on it earlier in the week but the insane weather kept me indoors.) Hopefully I'll have pictures (and his permission) to share after the event this afternoon. Patterns! This store used to have their patterns bundled up in bags with maybe 4 patterns in each bag. You couldn't see what they all were, so I never bought any. Now they are selling them individually so I picked these ones. I have to say that the main picture on that top right pattern is downright ugly, but I've been wanting to make one of the cross-back sundresses for my girl, and I'm pretty sure view D (the bottom middle image) of this pattern is the one I'm going to make. Maybe without the ruffle, though. Also. I have no reason for buying the baby layette pattern, except that it was too pretty to resist. I do love all the little dress patterns; the three from the 60s/70s all look like they should be made from double knit polyester though. I'm going to have to come up with a better fabric choice than that. Any suggestions? 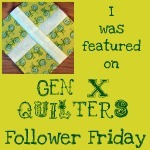 Finally, I'm excited to be featured on Gen X Quilters today! Head on over to read a little more about me, if you want. :) Thank you, AnneMarie! I really like the two nine patches on the lower left first row ... very pretty. 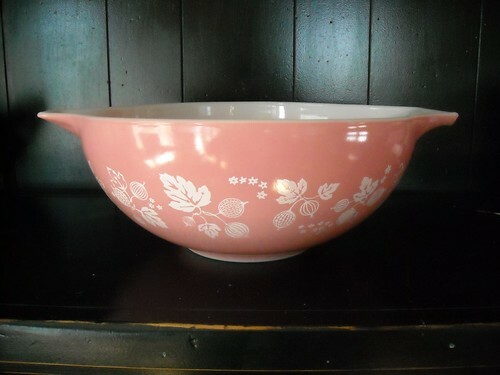 And totally jealous of your pyrex find - in pink too! I don't have any pattern fabric suggestions... I'm scared of sewing clothes! Good luck! I am totally drooling over your finds. Awesome!!!!! Great finds , I love that pink bowl . I love the cross-back dresses. If you futz with tracing the pattern you can make it out of two peices, one outside and one inside and make it reversable. Fun patterns. I think a light denim with a bit of spandex (there's one at JoAnn's that has an offwhite base instead of the white most denim has... I use it for everything, I swear) would look really cute for those 70s ones.